As you know, San Pancho, Mexico was a town that surprised us. A month’s stay easily turned into six months and it may well be a place we plant roots. We loved and love it there, and my oh my how much we miss it. In homage to our beloved town, here are some reasons to love the San Francisco you’ve never heard of. This includes things to do in San Pancho, Mexico and plenty of San Pancho travel tips. *Please note that most of San Pancho closes for the low, rainy season (from around May-October). I never quite got over the beauty of San Pancho beach. Beaches like this are usually filled with people and parasols, but apart from during New Year and Easter, San Pancho was always spacious. The ocean was intimidating so I rarely braved it, but watching the surfers, strolling the sand and marveling at the jungle backdrop more than made up for that. In the final weeks, we discovered phosphorescence, and danced to make stars in the sand. Sunset is the hallmark of a San Pancho day. Everything is arranged before or after it, and locals and travelers alike gather to watch it from the sand, often clapping for the main event. Without a doubt, the highlight of San Pancho for Steve and I were the people. It taught us the meaning of community like no other place we’ve been before. If one of us was ill, people would come knocking with remedies; we couldn’t walk down the street without stopping for hellos; and we made friends we imagine we’ll keep forever. This little girl was always on hand with an ‘hola!’ as we passed. Christmas day was a perfect example of our life there…when around 30 people gathered at our house for a pot luck lunch and secret santa. We’d only been there six weeks at that point. … and spotting some of the more unusual niches, like this excellent mattress truck. The opportunity to practice teaching yoga was one of San Pancho’s finest gifts. I loved my four-times-weekly classes and the community that built around them. Visiting dogs were always a highlight. My yoga classes were done by donation. From money to fruit to massages, students gave whatever they could. I wish all of life could be like that. 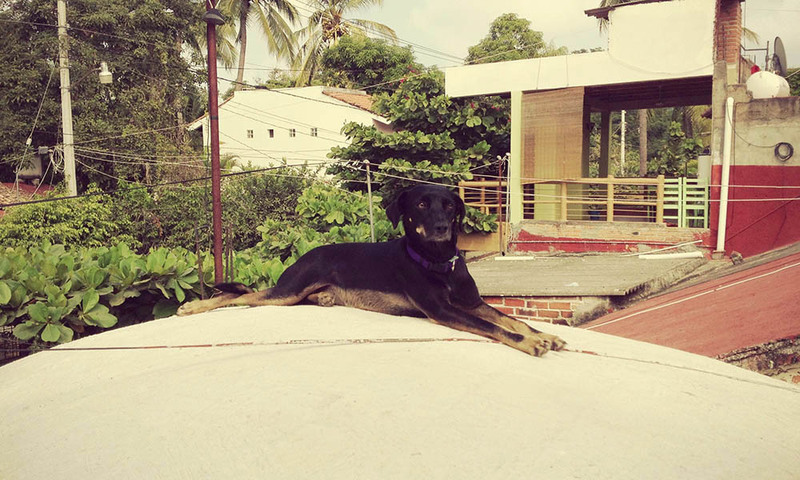 At first, we thought San Pancho was full of stray dogs but soon realised they all had owners. Dogs live a cat’s life there – coming and going as they please. Some of them became great friends. We miss them dearly. We lived above our landlord who had four excellent cats and appeared to host the town’s cat club. One of the visitors seemed outraged by our arrival in his adopted domain. He would always stare us down. We christened him Herman. Perhaps that’s why he hated us. Being so close to the jungle meant that some of the world’s more unusual creatures often graced our presence, often bringing to mind the pre-historic. 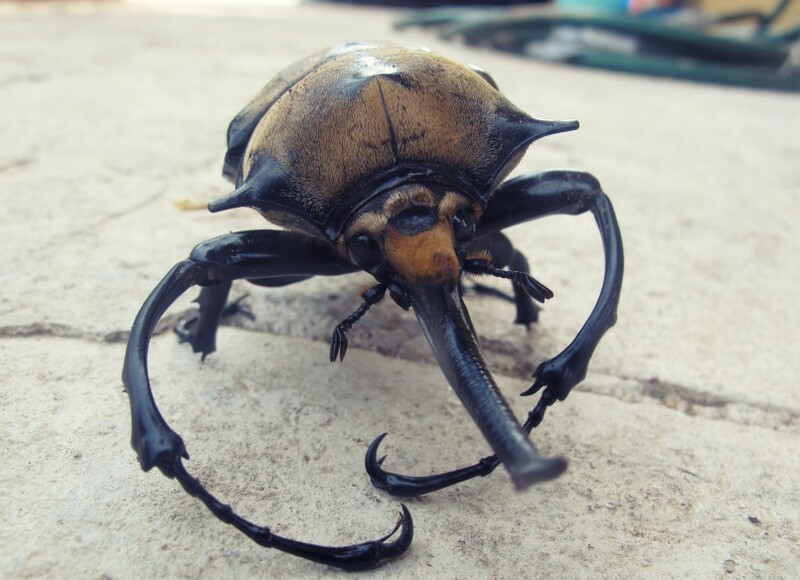 We loved the iguanas and this armor-clad beetle. Capomo is a wonder-drink and could single-handedly persuade us to live in Mexico. 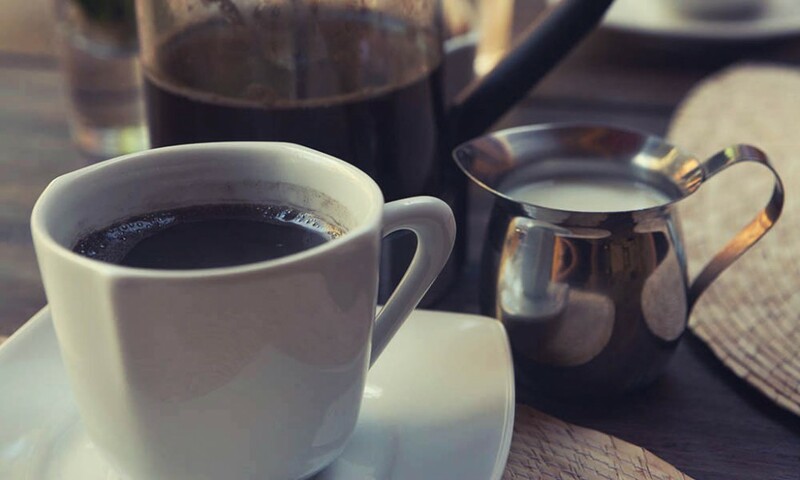 Made from the fruit of the capomo tree (also known as the Maya Nut), it’s a little like coffee minus the caffeine. In fact, it’s good for you with many health-boosting properties like plenty of magnesium. We ate more breakfasts here than our budget cares to admit, but it was worth every penny. 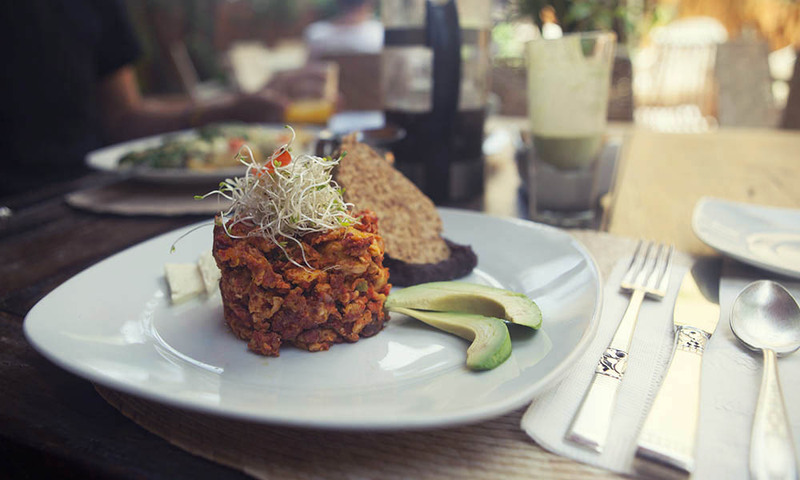 The breakfast/brunch menu is entirely vegetarian minus one fish dish, and consistently delicious featuring Mexican favourites as well as other more unusual dishes. The spinach omelette, vegan chorizo and huevos rancheros were our favourites, always accompanied by a capomo. We also loved the tequilla tasting on Fridays, which included one free shot of the house special as well as a a flight of three for 120 pesos. It was a great way to start the evening. The garden setting is suited to everything from a working breakfast to a romantic meal, and the best thing about Cielo Rojo is that everything is organic – an even better excuse to visit there. For our first few months in San Pancho, we wished for one of our digital nomad musts – a great café with wi-fi where one can comfortably while away a few hours working. 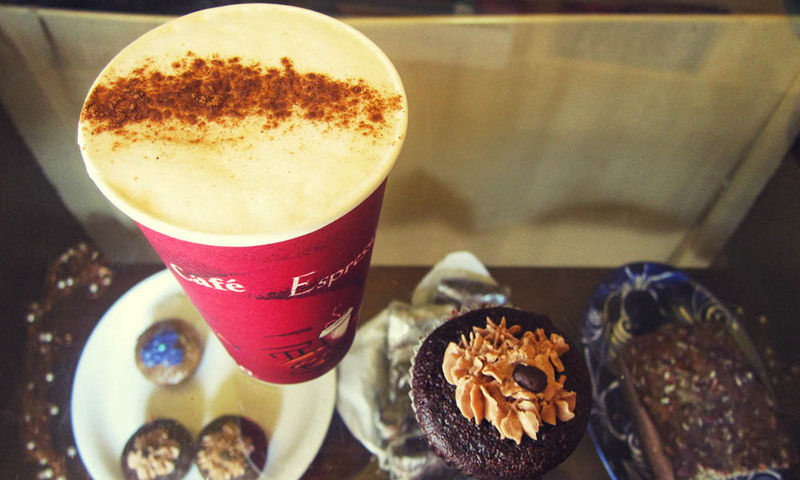 There are a few options in town but nothing hit the spot quite like the arrival of Café Manana. This stylish, homey café doubles as a artisan store and book shop. 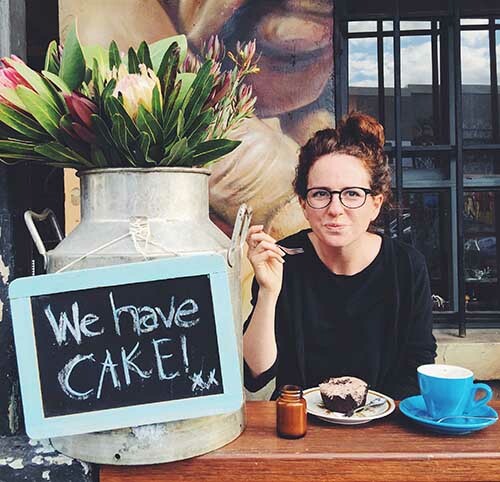 Run by the wonderful Jill and Lincoln, they’ve created one of our favourite cafes in the world. Upstairs is especially wonderful, with spacious wooden tables and garden views of gorgeous Bougainvillea. The cakes are incredible and the perfect size for a morning treat. I tried to try them all, and loved each and every one. Sadly we failed to get a photo (I was too distracted by the cakes). 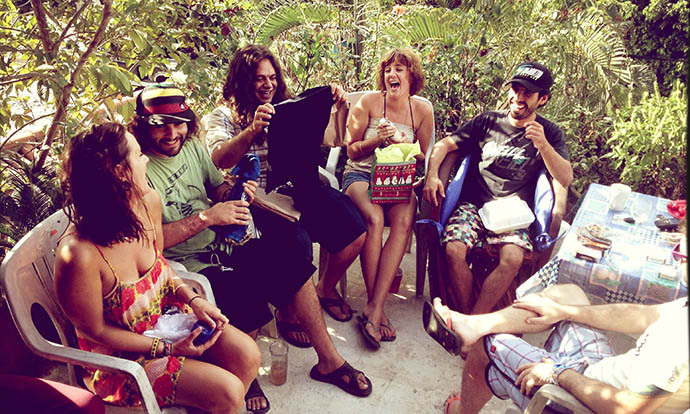 Many people cite Entre Amigos as one of the chief reasons San Pancho is so special. It certainly is an amazing place and many visitors come to volunteer there. Started by an American lady as a simple after-school activity club, it’s now grown to a huge community centre including a library and computers that the local schools use, a creche for babies, a thrift store, and a whole programme of activities for both children and adults – ranging from yoga to language lessons to belly dancing and much more. Each year they hold an annual fundraiser, which is always a grand event. Last year, one of the original art directors of Cirque du Soleil (who has a home in San Pancho) sent down some Cirque performers who taught the children their tricks. The silks are still up in the centre and circus lessons are among the most popular on the schedule. 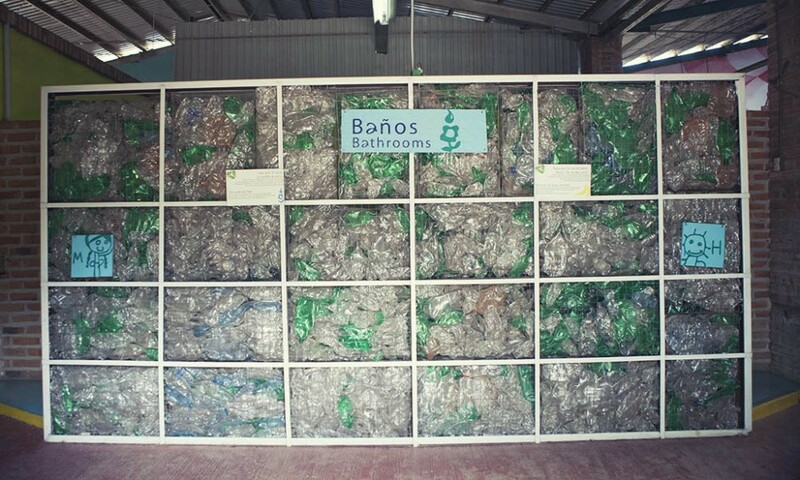 Not all of Mexico has the infrastructure for recycling, but San Pancho is lucky in that Entre Amigos doubles as the town’s recycling centre. Not only does it collect the town’s recycling and deliver it to larger recycling plants, it also makes use of some of the materials itself. There are glass, fabric and plastic workshops in the centre that make all sorts of objects that are sold in the centre’s shop. This is also doubles as a way for local people to learn a new trade. 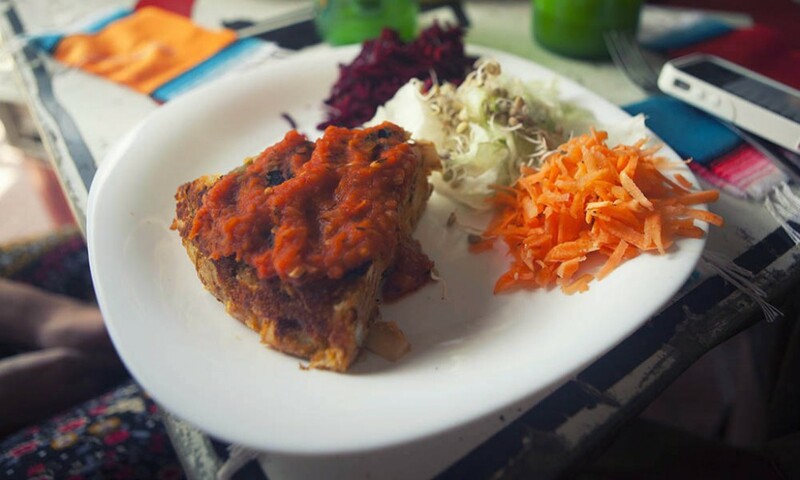 A recent addition to Entre Amigos is the fantastic vegan cafe, which was one of our favourite places for lunch. Run by the lovely Tom, it has a daily lunch special as well as regular menu including burgers and egg-less omelettes. It was always reliably healthy and delicious. Towards the end of our stay, the cafe started opening in the evening for tasty vegan pizza nights, often with live music in the garden too. 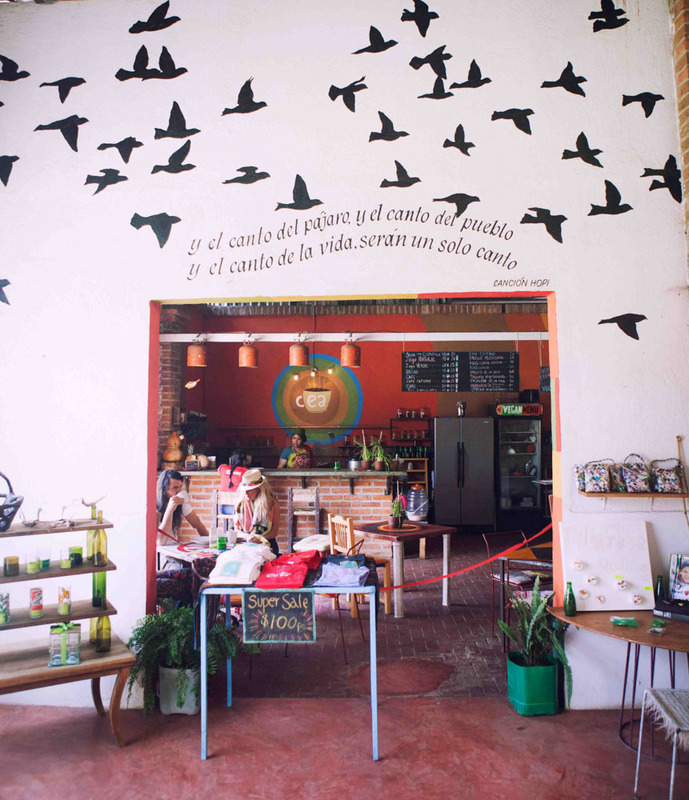 Entre Amigos is also one of only two places we found in San Pancho that sells capomo, and they even sometimes offers capomo cookery classes. San Pancho seemed to be a magnet for interesting people willing to share and teach their skills. 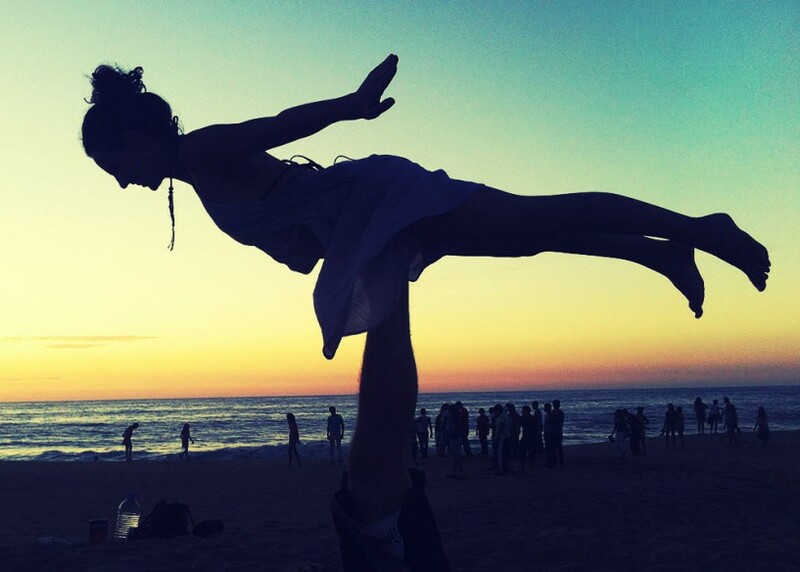 From musicians to African dance specialists to acro yoga teachers, there always seemed to be something new to learn. While we were there, the town hosted an annual capoeira festival, which featured world-class performance and teaching. 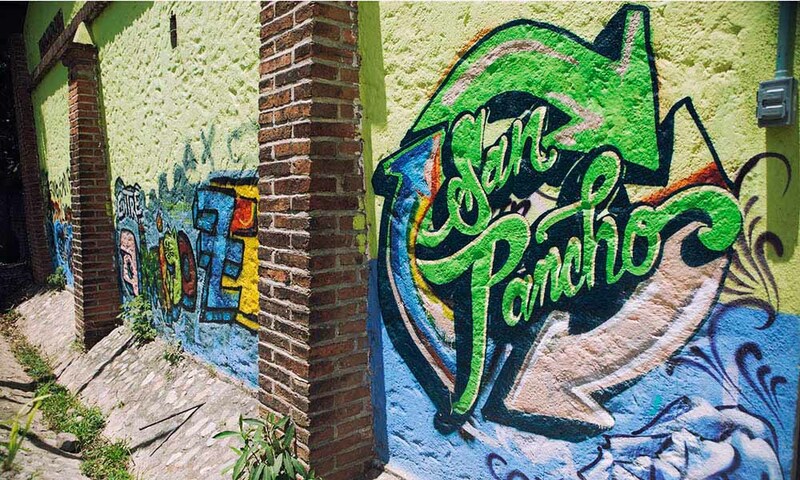 We never failed to be surprised by how much San Pancho had to offer! 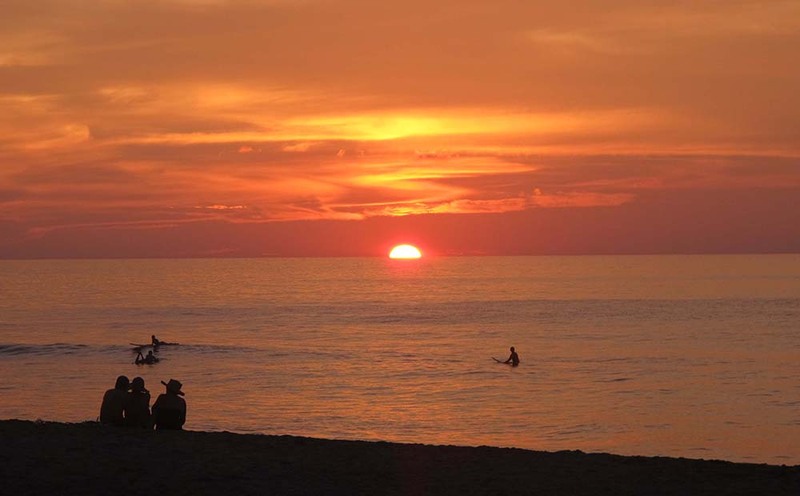 Just ten minutes from San Pancho is Sayulita – a bustling surf town that feels like a city in comparison to its neighbour. With a busy nightlife, boutique shopping and waves suitable for beginners, it attracts many more tourists than San Pancho. We enjoyed having it nearby but were happy to retreat back home. One reason we returned to Sayulita again and again was for the Friday organic market. Filled with yummy organic produce and artisan products, it was the perfect place to spend a Friday morning listening to the live music and eating from the plethora of awesome stalls. A man specialising in Thai vegatables, and another serving cacao shots were favourties. I’ll be writing a more detailed post on the market soon. 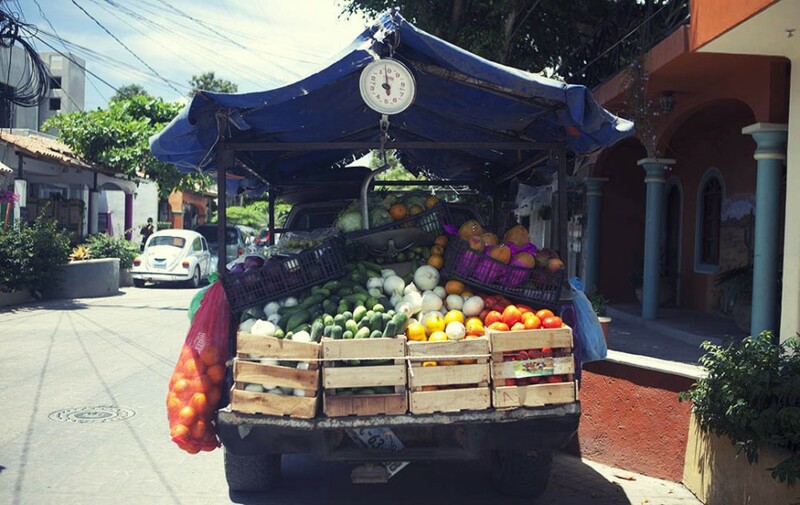 The market made us realise that San Pancho is surrounded by a number of organic farms – and Entre Amigos also has a growing organic garden. 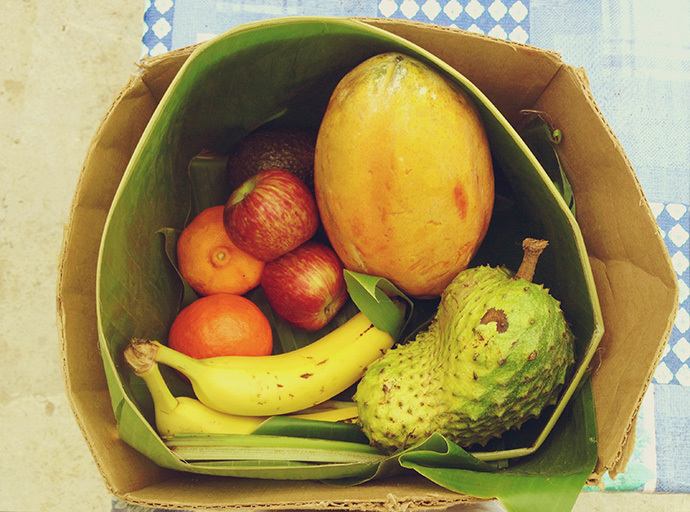 We made friends with two young farmer girls and arranged to buy a selection of their latest produce every week for just 150 pesos. The picture above is their stall at the market. They even had kale and pak cjoi – not things you easily find in Mexico. Wow, that sounds like such an amazing place to visit, and an impossible place to leave! 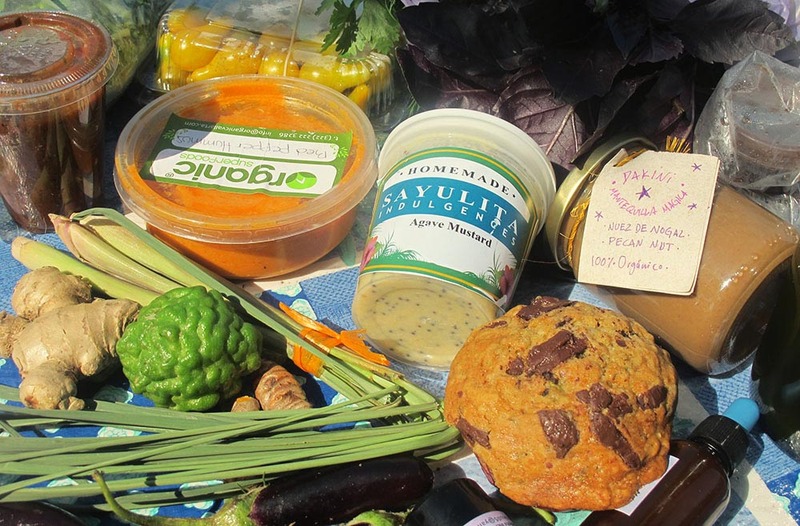 Those sunsets, that beach, the organic produce, yoga for trade! It sounds like such an amazing place, good food, a sense of community, dogs and cake. What more we ask for? I think this has definitely made our list of places to visit. As we’ve continued our travels since leaving Goa I have longed to find another place to fall in love with, but have yet to find one. San Pancho truly looks like the kind of place that could steal my heart, and I have added it my must-see list! All good reasons.. love the photo of the little girl, so sweet! 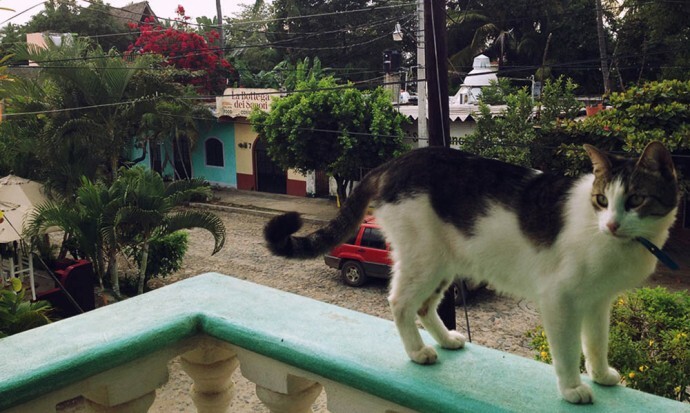 Well, I’m definitely going to have to take a cab down the street – I’m currently in Sayulita and haven’t made the trek to San Pancho yet, but it sounds lovely! I’m afraid I’m not sure how much of the town closes in the off season. I think it’s quite a seasonal place, so most things shut down / people leave. Thanks for pointing that out. It should be working now! I’m totally going there later this year!! Flying back to Mexico in September and I plan to travel the entire Pacific Coast..but looks like I might get stuck in San Pancho for a while 😉 Totally my cup of tea, thanks so much for opening this place up to me! All the best and much love to you both! Have a great time. You are sure to love it! Sounds absolutely perfect! Like a little vegan heaven! I’ll definitely be adding this to our wanderlist. Wow, what a place! Mexico is becoming more and more on our radar. 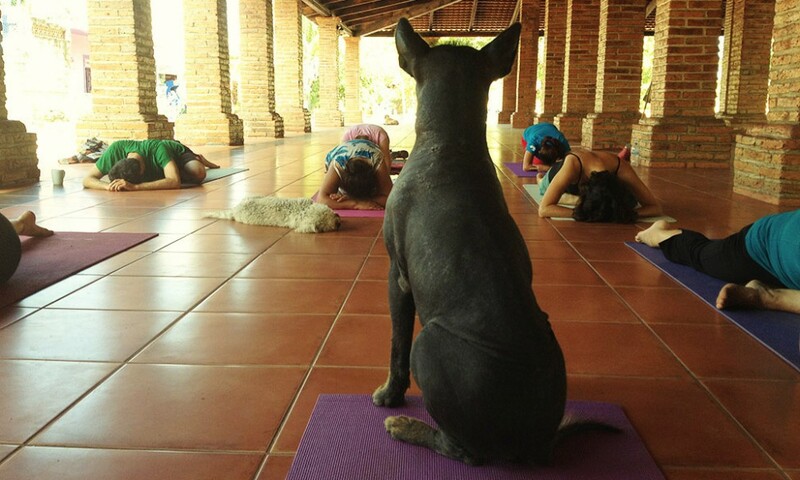 I love the photo of the dog watching the yoga. It looks like he/she is teaching the class! It really was excellent produce. We were so happy when we realised there was kale available! I love reading your posts about San Pancho. Dan and I are thinking of heading to Mexico for October and November, and now San Pancho is extremely high on my list! Although I’m not sure about those beetles… That could be a deal breaker 😉 I’m especially interested in going for the yoga though. Is it quite prevalent in San Pancho? After spending last year in Mexico your photos make me miss it. But I love it here in Asia too. What is a guy to do? Keep traveling I guess! I know! 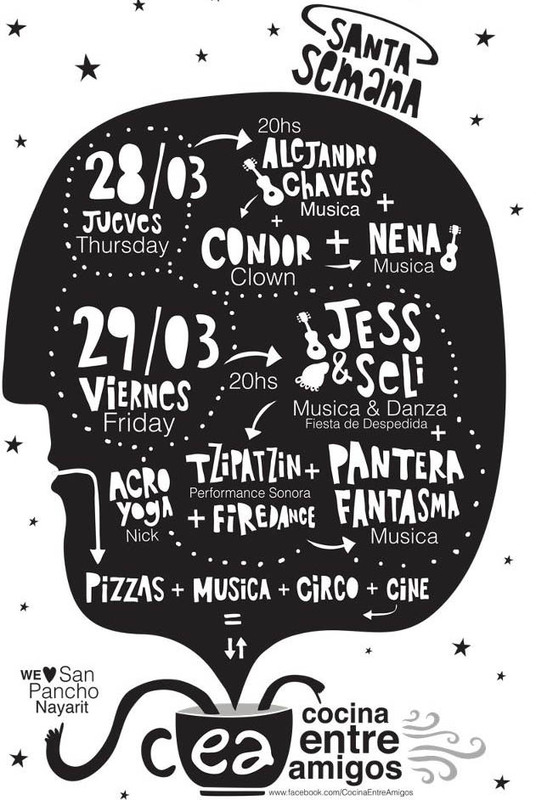 We are so tempted to head straight back to Mexico but Asia is now calling. We leave in two days time! Where are you off to next? Great write-up! I’m planning to spend some months in Mexico between December and April. I’m thinking of splitting the time between Playa del Carmen and San Pancho, would you recommend doing one before the other (even with regards to weather)? Hmmm, I can’t speak for Playa del Carmen but the San Pancho weather was great during all that time. If certainly got warmer as time went on. A lot of people say February is their favourite time in San Pancho for the perfect weather (it can be a little cooler around Christmas time). Have an awesome time there. Gorgeous photos! You’ve got me consulting an atlas, now. It’s just up from Puerto Vallarta on the Pacific coast. Hope you get there one day! Great article and gorgeous pictures! I can’t wait to read the second part of this entry! thanks for sharing! We’ll be sure to visit next time. I love the Costa Azul area. Mexico has been on my radar as a place for la long term stop, and you single handedly put San Pancho on the short list. Thank you for your great description of the city and surrounding area! Wow! Incredible photos. How could someone not want to visit San Pancho after taking a look at these. 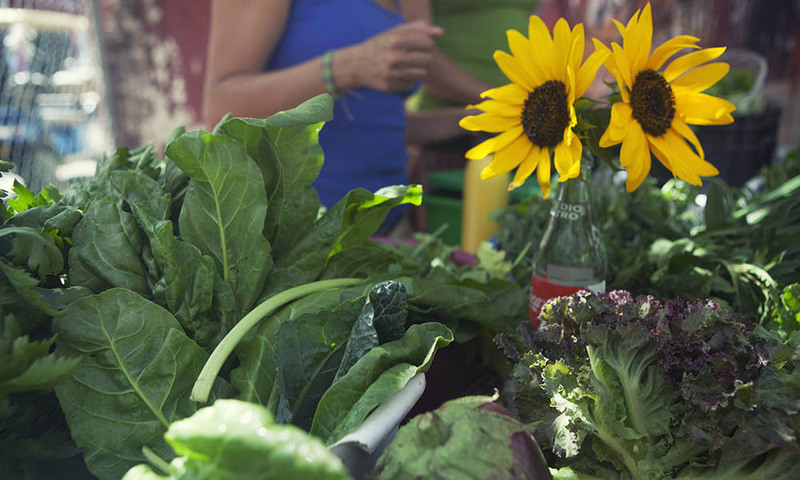 The Sayulita Organic Market is especially appealing. Thank you so much for sharing!! 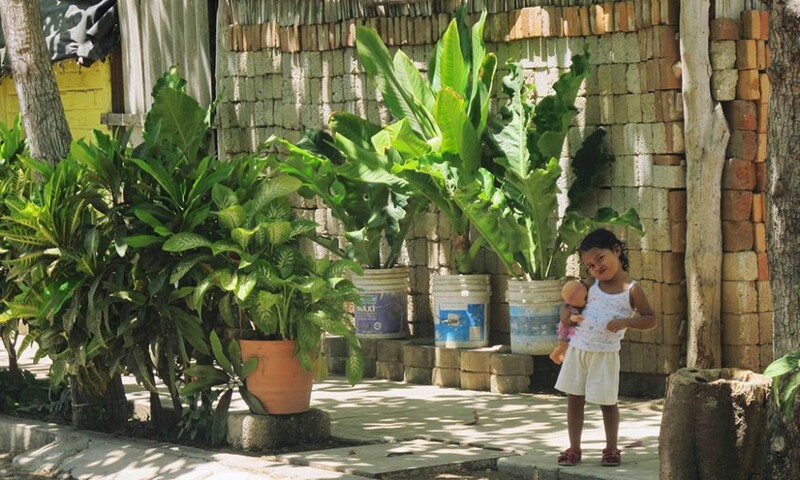 I’ve been in San Pancho for several weeks volunteering with Project Tortuga and the justice you give this place in your posts warms me so much. 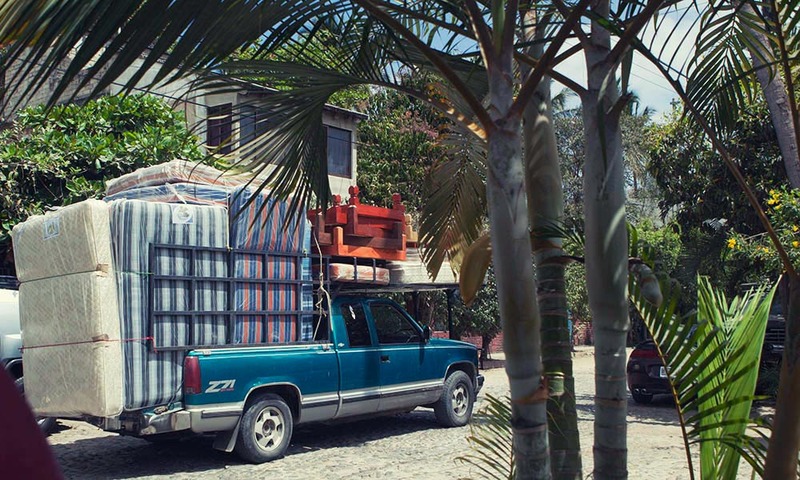 From the dogs freely roaming around the streets, the singing trucks, Entre Amigos, and the reverence of the jungle, San Pancho is a jewel of many facets. I’m looking forward to experiencing some of the reasons you listed! Thank you so much for making this post! Question: I have searched and searched but cannot find the hours that Cafe Arte is open. We are in La Penita and wanted to come over to SP on tues, take in a dinner at Cafe Arte but is it open on Tuesday? Great blog to find. We are in San Blas at the moment and heading to San Pancho tomorrow. Really looking forward to our time there. Hi! My girlfriend and I love your blog, and San Pancho! We are currently looking for a long-term rental and are having no luck at all…. we were wondering if you had any connections still?? Thank you, any help would be much appreciated!! My email is willtroy51@gmail.com. We can’t wait. we spent a week in Sayulita (above the surf shop, last year, the security alarms made it a early wake up call every morning.. and so so loud. ), , We explored the surrounding areas and San Pancho really intrigued us, so this year we book a 2 week holiday to san Pancho, and your stories have sent my mind in a flutter … we dont leave for 33 days, yes i am counting down, but so excited to explore San Pacho and all it has to offer..
Oooh have a lovely time. It’s still one of my favourite places in the world! 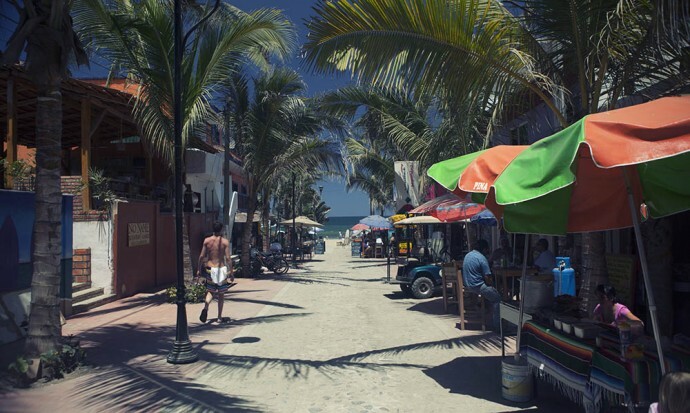 Did you get a chance to visit Rincón de Guayabitos just north of San Pancho? We are trying to decide where we should spend our extra day, Guayabitos or San Pancho. Sorry, but I didn’t go there. Have a great time!